This is such a delicious fall bowl packed full of goodness. We came up with this recipe after my son went gluten free and we were sick of eating buckwheat noodles with tomato sauce (I have learned a lot about cooking and we have all expanded our taste buds hahahaha). Enter in soba noodle recipes. 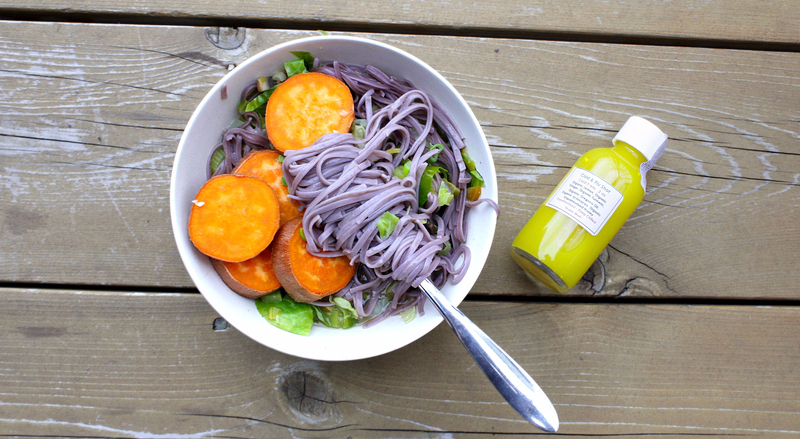 We just paired these delicious vibrant buckwheat and sweet potato noodles with a delicious curry and viola a delicious meal was born that my son can enjoy with no worries. Hope you love this recipe as much as my family did! And enjoy. Please leave a comment or follow us on instagram for more delicious recipes! A satisfying dish for pasta and curry lovers. In a medium mixing bowl smash the black beans with a fork until coarsely smashed. Add in the oats (I like to pulse the oats a little in the vitamix for a smoother consistency first). Add in the remaining ingredients and mix together. Form into 4 patties with your hands and place them on a lined baking sheet, OR a our cast iron griddle and place them into the oven. Cook for 15 minutes turning the burgers half way. Preheat oven to 350 degrees Celsius then add in sweet potatoes and cook until tender but firm (about 25 minutes). Meanwhile, on medium heat sautee the leeks, onions and garlic in water until onions are translucent (about 5 minutes). Add the green curry past, salt, and veggie broth and continue cooking for another 2 minutes. Add the carrots and celery and cook for 2 more minutes then add in the mushrooms, brussels sprouts and jalapeno pepper. Cook until tender adding more water if needed. Place buckwheat noodles into boiling water and cook to package instructions. Sliced cooked sweet potato (you can remove or leave the skin) and add them, along with the cooked noodles, into the veggie mixture. Mix, serve and enjoy.